Cartoons & Caricatures' Lee P. Sauer presented two different programs for older children at the Jay County Library in Portland, IN, on June 24 and 29. 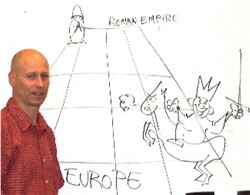 Sauer discussed how political cartoons developed in the Friday evening program, and presented a tongue-in-cheek history of cartooning in the Tuesday night session. 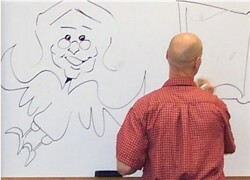 The artist appeared with two other memebers of indianacartoonists.com, Irene Joslin of Nashville, IN, and Dave Riddick, of Anderson, IN. The programs were organized by Jay County Director of Youth Service Linda Shreve. ILLUSTRATIVE LESSON—While discussing political cartoons, artist Lee P. Sauer creates a symbolic scene featuring a member of the audience. 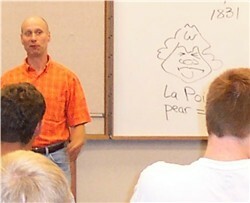 THE PEAR—Sauer shows how in 1831 Charles Philipon made fun of the shape of King Louis Philippe's head. GAME OF CHESS—Sauer sets a world stage for the political, social, religious and artist forces that bred cartooning.